ROGUEELEMENTS, troysbadmemory, Fastcat351c, Mad Raccoon, Bilbo, John King, OldCodge, DialecticKaos, Babe Truth and 4 Guests are viewing this topic. Hey everyone....Yoopers is trying to get 200+ comments on my thread. Stop in and say something....anything. Puk/Loden/DAT is lurking, so is Nobody’s Princess1 ! He will find out soon enough it's not easy being a YouTube Star. Wherein Loden throws Sweepstakesjunkie under the bus because she doesn't want to be the only one flirting with Doc. Plus Loden answers most questions, except why and how on earth she could now be supportive of the louse Troy Reid. That question she just ignores, just as her paramour Troy does when he doesn't feel like answering something. She is very much like Turd and shares many of his failings. She harassed, argued with and picked a fight with many members here, NOT just 2 guys. I almost responded to the thread but her reading comprehension is near zero. Nothing gets thru just like Turd. How did I get dragged into this? I want to stay out of this whole thing. loden dragged you in and kept bringing you up. she tried to say she never flirted with me and never pretended to be my internet wife after someone else mentioned it. then she went on to state you were internet wife #2 as if it changed any facts about herself. then myself and some others set her straight and she gave up. What a waste of energy. I have nothing else to say about anything in this thread except leave me out of it, I don't care who mentioned me, quit stirring the pot throwing my name around. Please! The whole thread should be tossed, IMO. Irrelevant. the only person bringing you in and throwing your name around is/was loden-dat-puke... and that was squashed as far as i know. Go over and give this a thumbs up it's a good Video! Troy's got till Monday to come clean. "Patriot Truther" put their 2 cents in! troy himself explained that the true meaning of "off grid" was that you are not using grid power from the power company. The last video he posted about the "grid assisted" battery charger just proves 100% he is not off grid. He completely exposed himself by this video alone. He has grid power and uses it. We all know this. 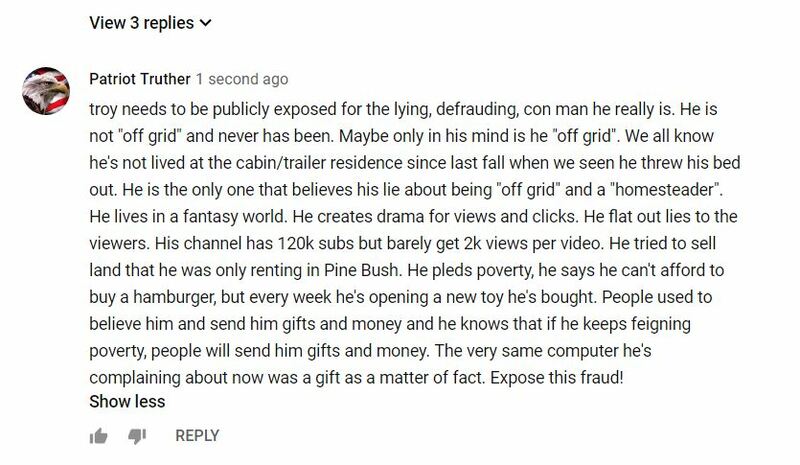 The real exposure that Yoopers talks about is him NOT living on the homestead. I predict this will be underwhelming. Preparing to yawn. Did this SC actually make it through his filters? This is on yoopers channel.